Hello there Loverlies! I received another book from Revell to review. 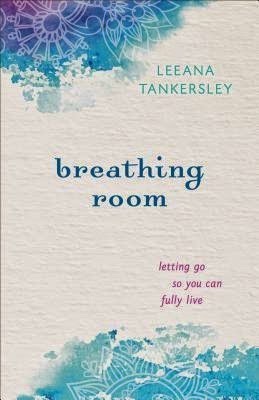 This book I received is called Breathing Room letting go so you can fully live by Leeana Tankersley. I have tried and tried to read and get into this book, but I have found it hard to keep focus and find it enjoying. Maybe it is because of my own anxiety being a bit extreme lately? Maybe it is the way it is written? I cannot fully figure it out and it makes me frustrated. The cover is very pretty and the book seemed like it would be very uplifting to read. Sadly I couldn't get all the way through the book. I guess you can say, I'm kind of on the fence about it. At least of what I have read so far. I will admit I can relate to her on what I have read, the depression and the stressful situations. I want to say though, if this book seems like something you would enjoy to at least give it a try. I would hate for someone to miss out on reading this book if it actually speaks to them and helps them. Have a blessed day!! Leeana Tankersley, like so many of us, began to feel overwhelmed by life. And like so many of us, she assumed she was struggling not because life is inherently difficult but because she was personally failing in some way. She knows firsthand what it is to bully yourself, to put yourself down for not being able to keep it all together, to compare yourself to others and find yourself lacking. But she's also discovered that all of the hurt and hostility and pain only add up to a life of holding your breath. What if we could exhale and let go? "Breathing Room " is her beautiful release of self-condemnation, her discovery of the rest that comes when we give ourselves some space to breathe. She draws readers in through shared experiences of perfectionism, jealousy, and striving and shows them how to let go, how to be radically on their own team, and how to experience the broad grace that Christ has offered all of us. Anyone who has been trying to do it all, who has been putting on a strong front and yet secretly struggling, will find in "Breathing Room" both a trusted friend and a generous Savior.